Mungo Jerry’s second album, Electronically Tested, became the second top twenty entry in 1971, and contained two number one hit singles in In The Summertime and Baby Jump. Tracks: She Rowed, I Just Wanna Make Love To You, In The Summertime, Somebody Stole My Wife/Baby Jump, Follow Me Down, Memoirs Of a Stockbroker, You Better Leave That Whisky Alone, Coming Back To You When The Time Comes. 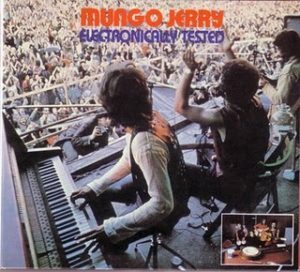 Mungo Jerry’s new album, Electronically Tested is such a vast progression from their first (Mungo Jerry), it’s unbelievable! Much more positive, much more alive, much more everything. In fact, and always that insidious beat pounding away. I Just Wanna Make Love To You is a real show-stopper lasting nearly nine minutes. In The Summertime and Baby Jump are both included, and there’s a wealth of other interesting stuff besides. The lyrics of Memoirs Of a Stockbroker will knock you out. Ray Dorset did all the writing except for one number, and his gravel-grinding vocals hit you right between the eyes. Album has just the right amount of light and shade, and the whole thing sounds like a live show. On Dawn, DNLS3020, this is exciting”! Mungo Jerry, having successfully shrugged off the “one-hit wonder” tag, now go on to prove that they can produce a comparably commercial album. Electronically Tested Dawn DNLS3020 £2.40) – yes, that’s the title! – shows some excellent examples of Ray Dorset’s remarkably witty writing. His tunes are, granted, rather repetitive – but they’re honest, down-to-earth songs, given lively, sing-along treatment. Also included is a lengthy, laboured version of I Just Wanna Make Love To You, the number made famous by The Rolling Stones, getting a Led Zeppelin feel. Basically, of course, it’s the expected good-time music with bags of jump – although You Better Leave That Whisky Alone is an amusing little message about someone’s mum being on the ale, and Memoirs Of a Stockbroker is similarly interesting. The overall impression is that at last one that can actually hear Ray Dorset’s lyrics through his sandpaper voice, though you’d still have to study the words of Baby Jump to find out what it’s all about! Well done, Mungo! A good, solid, unpretentious bundle of entertainment. 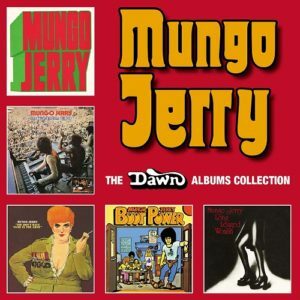 Thank heavens for bands like Mungo Jerry – bringing good vibrations to the heavy dominated pop scene. 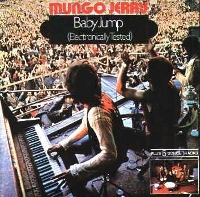 The cover of Electronically Tested shows the crowd on its feet swaying to the Mungo boogie at the HOLLYWOOD MUSIC FESTIVAL (it was actually the Rotterdam Festival) and that’s were Mungo Jerry are at. They’re not out to educate, that’s not their job. 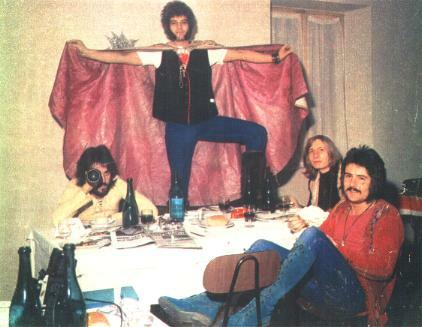 Their music is pure entertainment. It doesn’t test the mind, but keeps the legs in trim. Their music goes back to the music hall days, a fine British institution if ever there was one, where anyone can join in. Electronically Tested features both their first hit, the multi-million seller In The Summertime and their latest number one hit Baby Jump which features some of the best guitar that Ray Dorset has recorded. But any of the nine tracks on this album could be a single, except for their interpretation of Willie Dixon’s I Just Wanna Make Love To You. On this, they display an uncanny knack of catching the blues without the usual white-rock trimmings. Apart from the latter, all the songs are Ray Dorset originals and only the insipid Follow Me Down lets the side down. Melody Maker, March 27th, 1971. An attic in Soho, a few beef sandwiches and a bottle of wine might not sound like the ideal combination for reviewing an album by Britain’s recent No.1 group, but when Ray Dorset is there with you to talk about the LP, the circumstances are quite acceptable. For Ray is one of pop music’s better talkers and he displays a disarming honesty which makes conversations more than just interesting. The album begins with She Rowed. It first struck me that it sounded like T.Rex . There’s plenty of boogie piano and a squeaky guitar solo. A good bit of rock’n roll actually and you find your feet stamping. Later on there’s a nice kazoo and guitar duet. Ray Dorset – “We did a gig at Borough College before we were Mungo Jerry and we got completely out of our heads and I grabbed hold of Paul’s guitar outside and started playing this song. “I went home and put it down on my tape recorder and at the same time I was stamping and playing the bongos”. I Just Wanna Make Love To You begins in much the style of Willie Dixon but with the addition of a heavy bass guitar. It’s not really fair to keep making comparisons but the harmonica playing reminded me of the early Stones. As the track progresses it veers away from the Dixon version and becomes very much a Mungo Jerry original. It’s just under nine minutes long, most of which is good stomping music. Very intoxicating. 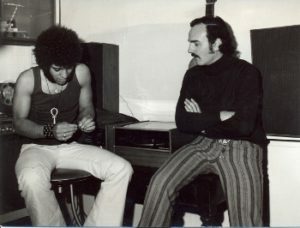 Ray Dorset – “It was done at one of our late sessions. We did it without any over dub and did it at the first take”. Next is In The Summertime which we didn’t bother to play for obvious reasons, so we went on to Somebody Stole My Wife. This is a pub song. Grab a bottle and blow into it, spill your beer on the floor, gather round the piano and sing and you’ve got the idea of the song. It’s a complete ‘Knee’s Up Mother Brown’ thing. Ray Dorset – “It was written in a working man’s club. We used to do odd gigs in British Legions and working mens clubs and we ran out of numbers as usual so we made this one up on stage”. Side two opens with Baby Jump which we also didn’t play. The second track here is Follow Me Down. It’s about getting out of the polluted city with a chick and having a good time in the country and who’s gonna argue with that? Ray Dorset – “We did a gig in Sheffield and I went in to get some plectrums and the shop had a lot of little gear and I bought a baby accordion. I was sitting in the hotel trying to figure out how to play a twelve bar on it and I kept getting it wrong and somehow I wrote this melody. In America, I played it again and Barry (Murray, the group’s record producer) said we should record it but I didn’t have a real lyric and when we came to record it I just wrote the lyrics there and then”. Memoirs Of a Stockbroker. Reminiscences of someone’s youth. It shows that that good lyrics Ray can write – there are things about pulling little girl’s hair at school, suffering a bad job, buying an outraged father a pint to calm him down because you got his daughter home late. In fact most of the things that happen to most blokes. The music jogs along with the lyrics and comes to a full stop as the singer reaches his old age. What is particularly effective is the way in which the melody remains the same but changes in tone as the tale progresses, growing old with the singer in a way. You Better Leave That Whisky Alone. A de-da-da-de-da-da song with a rolling highly-strung piano, kazoo and all manner of fun sounds. An irresistible melody that ought to set a butcher’s boy whistling from Land’s End to John O’Groats. Coming Back To You When The Time Comes. In view of the fact that I’d just had a row with my lady when I heard this, it meant a lot. However these dreadful personal hang-ups apart, the song is rather untypical of Mungo Jerry. It’s slow and somewhat sombre but still with a beat. There are vocal harmonies, a bleeding guitar solo and sympathetic backing from various other instruments. Then he had another beef sandwich, finished off his glass of wine and left for another appointment. Richard Green, NME, March 20th, 1971. Electronically Tested was titled Memoirs Of a Stockbroker in the U.S.A and was the only territory to include the rare recording of Have a Whiff On Me, recorded on Mungo Jerry’s tour of the States the previous year. “Ray Dorset, or Mungo Jerry as he is more popularly known, must be one of the most under-rated singers ever. Not only has his hit In The Summertime sold more than 40 million copies in its 40 odd year life, but this CD, his second, is still as great to listen to as it was when it was released. An amazing collection of amazing songs”. “A great example of the links between jug band music/blues and rock and roll”. “Brought back some wonderful memories! Originally won the vinyl version whilst at school playing pool. 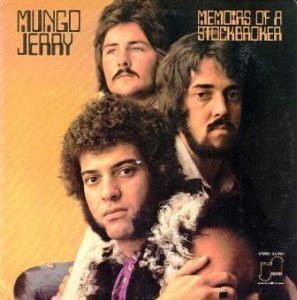 At that point I did not really have any idea who Mungo Jerry were except for In the Summertime but was immediately hooked. Any band that could produce such a good groove without a drummer must have something? Saved me from the onslaught of early metal, much to the disgust of friends at the time. There really are some gems here, especially She Rowed (should have been a single? ), Memoirs of a Stockbroker the wistful and pleading Coming Back to You plus Follow Me Down. The only non-Ray Dorset song being I Just Wanna Make Love To You, a 9 minute epic. Sadly the original incarnation only lasted for one more album (You Don’t Have to be in the Army) but during this relatively short time some wonderful foot tappin music was produced with no 30 min guitar/drum solo’s etc or heavy and hard to digest lyrics. To this day this album still sounds fresh and undated and especially in the summer months spends a good deal of time in my CD player. Give it a try and I doubt it will disappoint, if it does then I reckon something is wrong with you”.